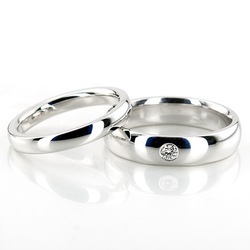 A classic, this his & hers Dome and Solitaire wedding ring set is great choice for lovers of simplicity and elegance. Solitaire band is set with 1 Round Cut Diamond in the center of the ring, which has a total carat weight of 0.08 ct. The diamond is graded G in color and SI1 in clarity. Rings are high polished. Total Gram Weight*: 11.05 grams. 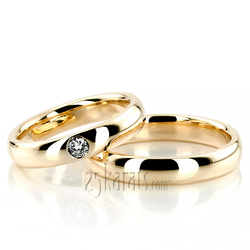 Diamond size 1: 1 piece x 2.8mm Round cut with Burnish Set - G/H Color - SI1 Clarity - 0.08 ct.tw. 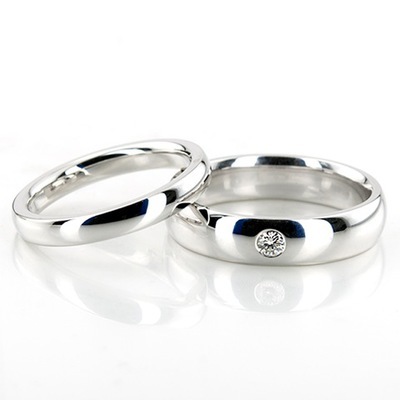 Total Carat Weight: 0.08 ct.